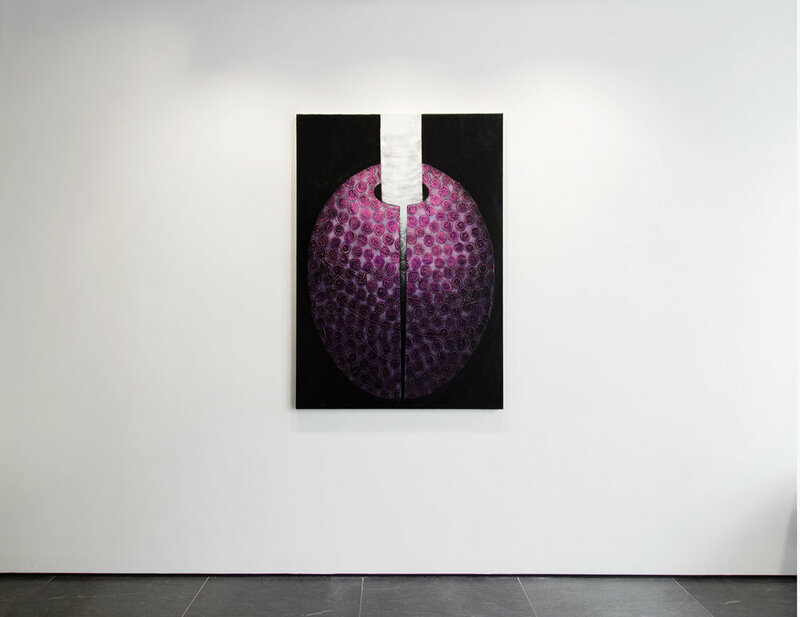 The Gallery@1GAP is proud to present artist Sarah Dineen’s first solo exhibition in New York. Certain Dark Things is a series of recent large-scale paintings influenced by Pablo Neruda’s Sonnet XVII. Neruda’s short love poem inspired over sixty paintings and numerous works on paper over a five year period, a significant selection of which are on view for the first time here. As a response to Neruda’s romantic prose, Dineen makes lyrical paintings depicting themes of secrecy, love, and darkness. Creating works as large as nineteen feet, she builds a visual field so complex it forces a close engagement with the viewer. Strong geometric forms dominate her canvases; many are centralized and symmetrical, with a recurring use of industrial shapes and surfaces: tubes, slabs, microphones, coffins. Other works tend towards the organic, suggesting heads and bodies, plant-like vessels, fountains, and urns. Dineen's strong architectural forms evoke the gravity of love and sexuality, accentuating potential for beauty as much as the prospect of darkness and loss. While Dineen’s paintings are inspired by Neruda’s poem, she ultimately makes her own rules about what visual, intellectual, and emotional elements to reveal or conceal in her works. Using minimal colors hemmed by gray and black, her surfaces command the painterly field with patterning and impasto that sometimes feign steel or concrete, while other times become light, even decorative. While earlier paintings employed fluid washes and delicate layering, Dineen’s recent pieces tend toward a matte, graphic sensibility reflective of the series’ ongoing consideration of Neruda. In her newest works, solid objects enter hollow ones within hard- edged, geometric compositions, suggesting love as an emotional as well as a physical force, a dark and powerful entanglement.